Muscícapa pectoralis Latham, 1801, Port Jackson, Sydney, New South Wales, Australia. Up to 70 subspecies. English: Golden-breasted whistler; French: Siffleur doré; German: Gelbbauch-Dickkopf; Spanish: Chiflador Dorado. 5.9-7.5 in (15-19 cm); 0.05-0.06 lb (21-28 g). Black head and bill with golden yellow underparts and white patch on throat. 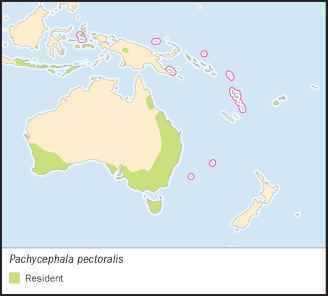 Widely distributed from east Indonesia through New Guinea and Australia to southwest Pacific islands as far as Fiji. From sea level to above 6,900 ft (2,100 m) on some islands. A broad range of habitat types, from rainforest, secondary growth, eucalypt forest, and drier woodlands, occasionally mangroves and urban areas. Territorial; usually solitary, sometimes in pairs. Easily observed and can be attracted by whistles. Mainly found in lower and middle storys, less often in lower canopy. Some winter movements of birds in southeast Australia to areas north and west, including dispersal of young and altitudinal movement from higher altitudes; mainly sedentary elsewhere in range. Behavior generally quiet, unobtrusive except when breeding, when very vocal. Forages primarily in thickets and low and middle storys. Obtains food mainly by gleaning from branches, twigs, and foliage; occasionally hover-gleaning or hawking. Food includes insects, spiders, and berries. In Australia, breeding takes place from September to January, with one brood being reared. The male and female build the cup-like nest of sticks, twigs, grass, and bark, bound with spider web, placing it in fork or thick shrub up to 20 ft (6 m) above ground. The clutch is one to three eggs. These can be quite variable in color, with a background of cream, cream-buff, pale olive or salmon, marked with olive brown or reddish brown and gray, and underlying lavender blotches, which often form a cap at the larger end. Both sexes share incubation (14-17 days) and care of young (fledging period 10-13 days). Not threatened. Common to moderately common in most parts of range.